Context of the achievement. Where did specific learning happen? When did achievement was unlocked? Description of the achievement. What new knowledge, skills and/or change of attitudes/behaviours did happen as a result of learning? What kind of specific achievement was reached? Tasks completed. What did badge earner complete/demonstrate in order to qualify for this badge? What roles or activities did badge earner undertake? What evidence did badge earner submit to claim this achievement? Assessment procedures. Which assessment procedures were in place to verify the badge achievement and evidence? Who was involved and how was the assessment carried out? How will others, outside of your context will comprehend achievement represented by a badge? Badges will be viewed by diverse audiences: badge earners, future employers, formal education staff, others. What style of writing is common/acceptable for the context(s) where a badge will be used/viewed? Playful badge descriptions can motivate learners, but may be taken less seriously in more formal contexts. It is good to test samples with targeted audiences. Who does verify the badge achievement and evidence? Badge description can be written from the first-person’s perspective, when the badge achievement and evidence is self-assessed by a badge earner. When badges are issued by staff, then the third-person’s perspective can be used to describe earner’s achievements. How long is not too long? Badges will be displayed on the web, it is good to have badge description that tells just enough of information to understand the achievement and its context. Humans vs. machines. Badge metadata is machine-readable. This means that badge information may be discovered by search algorithms and filtered accordingly. 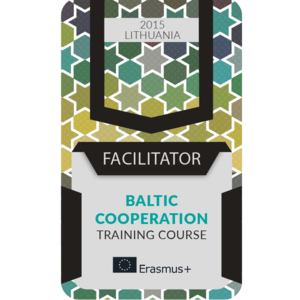 Owner of this badge facilitated the international staff training project ‘BALTIC COOPERATION’ during 23-30 August 2015 in Lithuania. This project offered opportunities for participants from Estonia, Latvia, Lithuania and Poland to develop their personal and professional competences. This training course focused around the topic of regional youth policy development. During this activity facilitator supported participants to develop their social and professional competences through actively engaging them into the training activities. As a team member, person contributed to the training activities and teamwork. Training participants and team members reviewed facilitators performance during the project. Project was co-funded through EU Erasmus+ programme.